Tennis is one of the world’s most beloved and popular sports. This is probably due to it being really fun and exciting, but also because of how quickly and easy it is to learn how to play tennis. Requiring only a usable court, a tennis racquet, a few tennis balls and a willing friend, it’s possible to become an avid player and fan of the game in just a few hours. In this concise guide to learning tennis, you can become familiar with everything you need to know about venturing into this great game. If you’ve ever watched a game of tennis, you know that the rules are actually very simple, even if you don’t always understand what’s happening. Tennis can be played with two players (called “singles”) or four players (called “doubles,” with two players on each team), and the most basic objective is to hit the ball in such a way that it bounces at least once in play on the opponent’s side of the net, but so that the ball is also unreturnable by the opponent. Once the ball bounces a second time, the play is dead and a point is awarded to the last player to hit a valid shot that bounced in bounds.The tennis play begins with a service (more commonly referred to as a “serve”). The player to serve first is often decided by a coin toss, and this player must hit the ball from behind his own baseline, the line parallel to and farthest from the net. The ball must also be served from the correct side of the center mark, the small hash that divides the baseline in half, and the server will alternate which side he serves from on each successive point. The server must hit the ball so that it lands in the opposite side’s rectangular “box” made by the net, center service line, service line, and singles boundary.The server is allowed two attempts to hit the ball into this service box. If he fails in these two tries, the other player is awarded a point. If he succeeds in landing the ball in the box, it is up to the other player to validly return the ball. On a serve, the ball must bounce at least once before it can be validly returned, but on all other shots it can be returned from the air. When a player fails to return a ball by placing a valid shot in bounds (within the court for doubles games, or within the court but excluding the long rectangular boxes on either side for singles), the play is over and the opponent is awarded a point. Scoring is probably the most complicated aspect of the game of tennis. Instead of counting by constant multiples, the scores you can have in tennis are 15, 30 and 40. If a player has yet to score a point in a game, his score is referred to as “love” instead of zero. A player wins a game when he has a score of 40 and then wins one additional point, provided that the opponent’s score is 30 or less. If both players achieve a score of 40, the score is referred to as “deuce.” Once a game is at a deuce, a player must achieve a two point lead over his opponent to win the game. After a deuce, a one-point lead is called out as an “advantage” for the leading player and all successive ties are still deuces. An additional point for the player with the advantage ends the game. A player wins a set by winning six games and two games more than his opponent. A player typically wins a match by winning two out of three or three out of five sets. It’s also important to be familiar with the types of swings in tennis, of which there are three basic types. The first is the serve which starts play for each point. If you are just beginning to play tennis, it may be easiest for you to serve underhand. 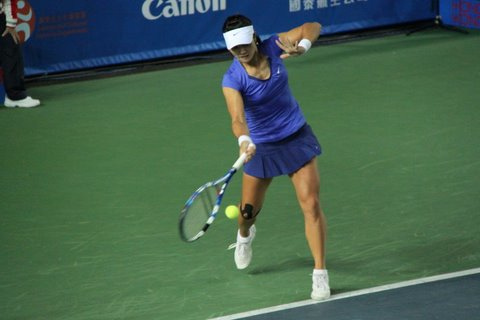 Most experienced and professional players, however, serve by standing still, tossing the ball high into the air, and hitting it overhand on its way back down. The most common type of swing is the forehand, which is used when the player has enough time to get in position and hit the ball from the main-hand side of his body. It is the easiest and most natural swing, and is executed with the inside of the wrist pointed to the opponent’s side of the court. The backhand is used when the player must hit the ball from the off-hand side of his body. This shot is more difficult and is executed with the back of the wrist pointed to the opponent’s side of the court. If you want to be a successful tennis player, you’ll need to become familiar with effective tennis strategy. Most basically, you want to place your shots in locations that will make it hard for your opponent to return them. Usually this means using the whole court and making your opponent move to one side to return one shot and then far away to the opposite side to return the next.Another way to gain an advantage is to play closer to the net, allowing you to return balls that come over more quickly. Playing this way is aggressive because it also makes it more difficult for you to return shots. Topspin is key for success in tennis. Striking the ball with a tilted racquet and a low-to-high swing will give it topspin. This is great for two main reasons: players can hit the ball much harder and faster because the flight of the ball arks up over the net, then down in bounds (instead of soaring wildly out of play); it also makes the ball bounce high with tough-to-handle spin, pressing opponents further back.